When Amazon unveiled its Kindle Fire HD 2, we all were quite worried about how Barnes & Noble would respond. The Barnes & Noble has made us agree to the fact that it does have HD plans of its own when Amazon unveiled the Nook HD and Nook HD+ on the 25th of this month. Barnes & Noble's new Nook HD is lighter, faster, and may be the best screen on a 7-inch tablet to date. The Nook HD, a 7-inch tablet whose name Barnes & Noble insists on capitalizing but which for the sanity of the reader we refer to as "Nook." B&N claims that its Nook HD has the highest display resolution ever for a 7-inch tablet at 1,440 x 900, beating the 1,280 x 800 display of the Kindle Fire HD. The first thing you notice about the Nook HD is that it looks like a Nook. It isn't easy to differentiate among 7-inch slabs, but Barnes & Noble has paid attention to the details. Whereas most of the market goes for edge-to-edge glass, the Nook HD has a small bezel, which gives you something for your fingers to grasp. Isnt that GREAT?? At 11.1 ounces (315 grams) the Nook HD is still noticeably lighter than the Kindle Fire HD. The device measures 9.5 x 6.4 x 0.45 inches. And, despite its bezel, it is about half an inch narrower than the Fire HD, making it easier to grip in one hand. 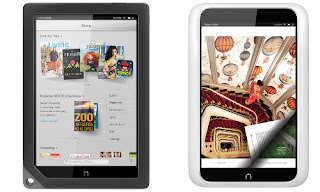 The Nook HD uses 1GB of RAM and an OMAP 4470 1.3-GHz CPU, which should make it like real fast. Barnes & Noble claims that when it comes to graphics processing, it will be 80 percent faster.It runs on Android 4.0 OS. It also includes built-in storage of 8GB and also has a microSD slot which allows memory to be expanded upto 32 GB. It supports all kinds of music and video playbacks but it does not have a camera. B&N is attacking Amazon head-on, claiming in charts and in talks with reporters that, compared with the Kindle Fire, the Nook HD and Nook HD+ offer better screens, lighter weights, and a better reading and shopping experience. To keep pace, Barnes & Noble added innovative features that would allow each a family to share a Nook tablet, with each user able to create a home page and customize preferences, the first table to do so. There are also parental controls that can prevent kids from reading anything inappropriate or go shopping on the digital stores. "We are playing in the tablet space, but reading is at our core," Barnes & Noble Chief Executive William Lynch told Reuters in an interview on Tuesday. 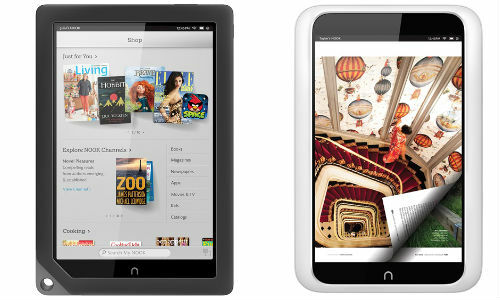 The Nook HD will cost $199 for an 8GB model and $229 for a 16GB model. Both come with expandable storage options, so you can stick an SD card with up to 64GB of content into the device. The Nook HD goes on sale now and will ship in late October. 0 Respones to "Barnes & Noble NOOK HD"